Are your unmounted and clear mount stamp cases regularly cluttering your desk? Are they lost in your closets and drawers? The Stamp-n-Storage Double Stamp Case Shelf fits right in with our other products and provides space for those stamp cases you use regularly. 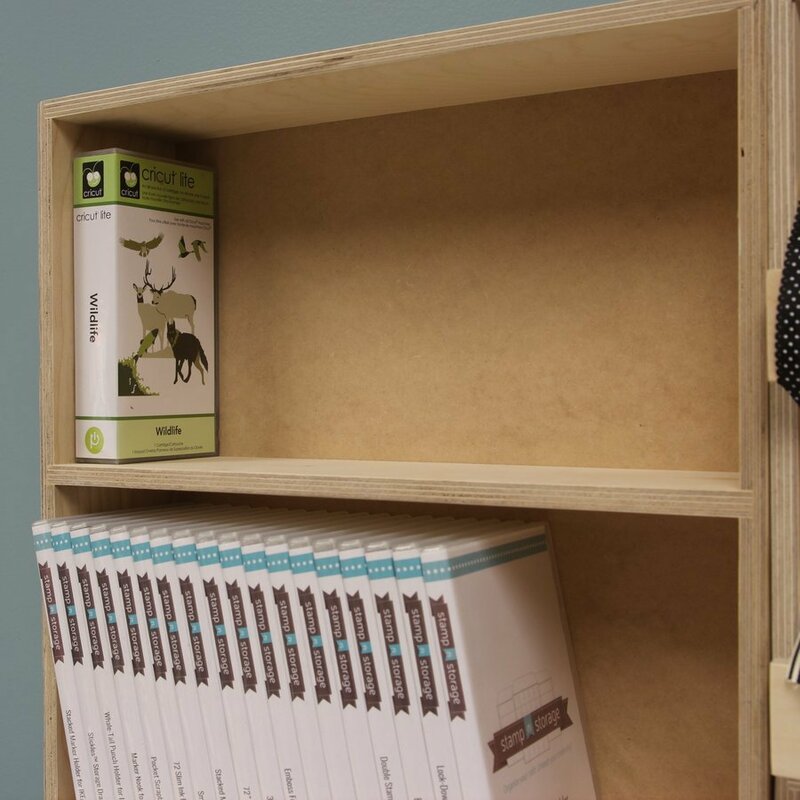 Stamp-n-Case shelves also work really well for storing your Cricut® Cartridges! Looking for a smaller shelf? Check out our Stamp Case Shelf. Made of Baltic Birch plywood delivered to you pre-assembled, sanded smooth and display ready! Double stamp case shelf was a must have! This case was just what I needed. I’ve been searching for an easy way to see my collection of stamps without having to dig through the every time. I just wish I’d found this sooner. The quality of the shelf is superior to anything I’ve found locally. Thank you! I purchased this shelf as I needed just a small additional shelf for my stamp sets. Fits perfectly on top of the stamp case behind my door. Love it! I have several Stamp-N-Storage products and love them all! The stamp shelf was the most recent addition to my craft space. It’s well made and holds 81 dvd-type stamp cases. I love these shelves! Their best qualities are sturdiness and mobility. I started with one for my crafting space beside the pad/reinker, punch and ribbon combination. Overtime I find that my needs change as my crafting evolves. Therefore, my storage items are constantly changed to accommodate the products that are kept close to hand. Mobility and sturdiness are qualities that never change and can be counted upon! First off, I love the quality of all the products I have purchased from you! This is awesome, I was amazed at the number of sets that it holds! Highly recommend it! As always, delivery is fast and packaging is awesome! I love my new shelf so much that I need another one. Nice looking, smooth shelves. Holds a lot of cases. All the products I have purchased from this company are well made. Will definitely buy from them again. Love it. Holds so many stamp sets and works great. I can see and find what I have when I need it!!! I so love the ease of getting to my paper, and keeping it protected from too much light! The cabinet came wrapped very well, the wood smell is fantastic. The wood is smooth, and quality craftsmanship A great transaction, I will order from you again. Thank you kindly. I love these shelves! I bought 3 in the beginning and needed another for all the stamps that I have! I ordered the Wall Mount stamp shelf, it is wonderful, all my stamps fit and my husband appreciated how easy it was to install. I had to order two to store all of my stamp cases. We just moved into an apartment coming from a large home where I could store my stamps on book shelves. Here in the apartment, with little room, I needed a much more economical system. These cases are amazing and I have all my stamps together and very handy. The cases themselves are so well constructed and look good without any stain or paint. So pleased with my purchase. WOW! Well made, light and holds a lot of stamps. I am going to order more for sure. Can't think of a better way to store your Stampin' Up Stamps!!!! I love this product cause you can use it either direction. It holds all your stamp sets in one place. I now have 4 of these in total in my Igloo. I have 4 (2 horizontal and 1 vertical) to hold my stamps that I either use A LOT or by theme (birthday) and current. I have devoted one just for my penguin display. These are made really well and aren't very heavy. And they will hold A LOT of stamp sets!